An up-to 10 stock concentrated portfolio with equal weights for each component are selected from the NSE listed universe (with additional filters of very high turnover stocks only) based on their Momentum ranking and nearness to their 52 Wk/ATH. It has been empirically proven that stocks near their 52 Wk/ ATH are likely to have and sustain a stronger momentum than those which are farther away. Momentum ranking is basically a ranking of relative out-performance of each stock with respect to its peer group over the last many periods. 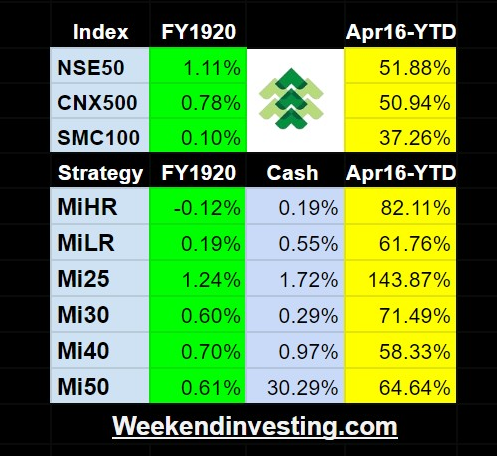 Every week the portfolio is reviewed and stocks which do not hold up the strategy allowable momentum ranks are shelved while new ones enter. At times when new momentum picks are not available the portfolio will sit in cash (in interest bearing instruments like LIQUID BEES). The single biggest advantage of these momentum strategies is that the portfolios are never allowed to bleed endlessly in loss and the winners are allowed to run to their maximum potential. The mathematical advantage of having big winners and smaller losers ultimately is able to bring home the desired portfolio gains. The strategy generated 131 trades in this period and the winner: loser ratio was 49:51. Each winner however was up on average +31.2% while each loser was down -9.2%. The portfolio max drawdown recorded was –28%. The average holding period for any investment was about 11 weeks. These results include all transaction costs including statutory charges etc. It also assumes a 5% return on idle cash if any. This is an entirely non discretionary strategy which means that there is no weight-age to any opinion , forecast or fundamental bias towards the stock selection or deletion and the strategy is run as per well tested mechanical rules. An advisory update is issued every weekend and the changes required in the portfolio (if any) are communicated via email to the user by 9:30 AM the following Monday morning to be executed by a single click by the user. Smallcase is a platform that we have chosen to use to help execute this strategy in a seamless manner. This service is now available for Zerodha, AxisDirect, HDFCSec and Edelweiss brokerage, Kotak, 5 paisa and Alice Blue users only. You can read more about the Step- wise investing process for this strategy.